Workshop session #13, Friday, September 9. Photo credit: Jesse Gates. We are grateful to Prof. Shi Xiangdong 施向东 and Prof. Atsok 阿错 for graciously offering to host the Fifth Workshop at Nankai University 南开大学 in Tianjin 天津, China, in 2019. More information about the Fifth Workshop will be posted here when it becomes available. This is the eleventh STLS-2016 circular with important last-minute information about the workshop. 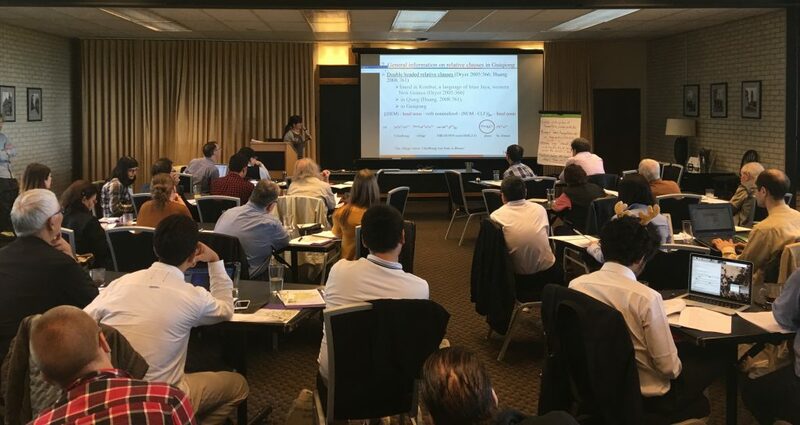 The workshop will be held at the University of Washington Club (also called “UW Club” or “Faculty Club”) on the campus of the University of Washington. We meet downstairs in the Yukon Pacific Room. On Thursday, please plan to leave your hotel at 7:30am in order to arrive at the UW Club around 8:00am. This will give you enough time to check in at the registration desk and eat breakfast before the Welcoming Remarks at 8:45am. Zev Handel’s mobile phone number is +1 (206) 954-4712. Please text or call if you encounter any difficulties as you arrive in Seattle and prepare for the workshop. Please see the page http://blogs.uw.edu/stls2016/travel/ for instructions (in English and Chinese) for getting from the airport to your hotel. We have a few graduate student volunteers who may be able to assist you with airport pick-ups. We are sorry that we have limited resources and cannot meet everyone at the airport, so we hope that you can find your own way without difficulty. However, if you think you will need help, please contact us at stls2016@uw.edu and we will do our best to try to arrange to assist you. We will have a digital projector at the workshop site. You are welcome to make your presentation from your own laptop computer. We will also have two computers available, one Mac and one PC. We will also provide a remote control for slideshows. If you want to use one of our laptops, please email us your presentation file in advance so we can have it ready for presentation. And let us know if you prefer to use a Mac or a PC. If you have a handout, please prepare 50 copies. If you wish to send us a file of your handout in advance (pdf format), we will be happy to photocopy the handouts for you. The program has been updated several times since it was originally posted. Please check the latest version at http://blogs.uw.edu/stls2016/program/ and let us know if there are any problems. Seattle is a casual city and we will promote a casual and collegial atmosphere at the workshop. Please dress however you feel most comfortable. There is also no need to dress up fancy for the banquet, though you are of course free to do so if you wish. A reminder that all registered participants will be provided with breakfast, lunch, coffee, and snacks during all three days of the workshop. There is a cocktail reception on Thursday evening (with appetizers) and a banquet dinner on Friday evening. All of this is provided without charge thanks to the generosity of our sponsors. We have accommodated all requests for special dietary restrictions (vegetarian, vegan, gluten free, etc.) at all meals. If during the workshop you have any questions about which foods meet your dietary needs, don’t hesitate to ask! Autumn weather in Seattle is variable. The weather is not easily predicted, so any forecasts you look at now may turn out to be inaccurate. You can expect daytime temperatures to be in the range 18-22 (65-72 Fahrenheit) and nighttime lows may get down to 10 (50 Fahrenheit). It is a good idea to carry a sweater and/or jacket with you, so that you can add and remove layers as the temperature varies throughout the day. Rain is possible during your visit. Rain in Seattle is usually light and transitory, so a hat or small umbrella should be sufficient. As you prepare to leave for Seattle, let us know if you have any questions at all. Once you arrive, if you encounter difficulties, call Zev Handel’s mobile phone number: +1 (206) 954-4712. We look forward to seeing you later this week! • Copies of all email cir­cu­lars are posted on the con­fer­ence web site at http://blogs.uw.edu/stls2016. Download a pdf of the workshop flyer. Please post widely! This is the tenth STLS-2016 circular with important information about the banquet. This circular is being sent only to people who have registered to attend the workshop. The workshop banquet will be held on Friday, September 9, 7:00-9:00 pm at the Talaris Conference Center. If you wish to attend the banquet, you must reserve a space before September 1. You may bring family members or friends to the banquet as paying guests. If you registered for the workshop by August 15, the banquet is free. The cost of the banquet for guests and late registrants is US$40, payable in cash at the workshop. In order to make a reservation, please fill out the banquet reservation form on the workshop website. On September 9, a chartered bus will pick up banquet-goers from the Deca Hotel at approximately 6:30pm and the TraveLodge at approximately 6:45pm and will return from the banquet site to the hotels at approximately 9:00pm. You are also free to arrange your own transportation. We will compile presentation abstracts into an abstract booklet for distribution at the workshop. If you are a presenter, please update your abstract by September 1 to include your name and affiliation. You can also update the content. Instructions for updating your abstract are on the Registration page of the website. Pre-registration has ended. It is still possible to register for the workshop by August 31, but we must charge a fee of $100 (payable in cash during the workshop). Register at http://blogs.uw.edu/stls2016/register/. If you are a workshop presenter, please visit the Presenter Information page on the website for information about preparing your presentation. • We will provide breakfast, lunch, and two coffee breaks during all three days of the workshop. There is a Thursday evening Welcome Reception and a Friday evening Banquet. All meals are free for attendees who preregistered by August 15. Dinner will NOT be provided on Saturday, the last day of the workshop. • We will NOT provide bags to workshop attendees. All of you probably have closets full of bags received at other conferences and workshops over the years. Please bring your own bag to the conference. We will provide pens, notebooks, and abstract books to registered participants. • The breakfast items include Ham and Cheese Croissants, Scones with Butter and Jam, Fresh Fruit, Greek Yogurt, Orange Juice, Coffee, and Tea. We provide this information so that you can decide if you wish to eat breakfast at the workshop or find your own breakfast outside. • The program on the workshop website continues to be updated. If you are a presenter, please take a look to ensure that your presentation is scheduled, and that your name and talk title are correct. Please contact the organizers immediately if anything needs to be changed. • If you are on the program but are unable to attend the workshop, please let us know immediately. • If you did not receive this circular directly from stls2016@uw.edu, and would like to be added to the mail­ing list for future work­shop announce­ments, please send a request by email to stls2016@uw.edu with your name and pre­ferred email address. • To be removed from this email list, send an unsubscribe request to stls2016@uw.edu. Monday, August 15 is the last day to pre-register for STLS-2016. Pre-registration is free. After August 15, the only way to register for the workshop will be on site, September 8-10. An on-site registration fee will be charged. The workshop program has now been finalized. If you are a presenter or session chair, please check the time and inform the organizers of any problem. If you are a presenter, please confirm the spelling of your name and your presentation title, and inform the organizers if any corrections are needed. The Fourth Workshop on Sino-Tibetan Languages of Southwest China (STLS-2016) will be held at the University of Washington in Seattle, USA, September 8–10 (Thursday–Saturday), 2016. This is the ninth circular with a reminder about upcoming deadlines and updates on workshop preparations. A confirmation email was sent out to all registered participants on August 1 from stls2016@uw.edu. If you did not receive the confirmation email, you are not registered! If you are planning to attend the workshop (whether presenting or not) and have not yet registered, please do so. Pre-registration is free and the deadline is August 15. After August 15, registration will only be available on site beginning September 8, and we may charge a registration fee. If you are registered but are unable to attend the workshop, please let us know immediately by email. Having an accurate count of attendees will help us to manage costs. The workshop has secured blocks of discounted rooms at two hotels. It is the responsibility of all workshop attendees to make their own arrangements for lodging. If you need a hotel room, visit the Lodging page of the website for instructions on making a reservation. August 7 is the final guaranteed date to make reservations. Some rooms may be released to the general public before that date, so please make your reservation as soon as you can. You might be able to make a reservation after August 7, but we cannot guarantee availability or discounted pricing. If you have dietary restrictions, such as Vegetarian, Vegan, or Gluten Free, please inform us by email to stls2016@uw.edu as soon as possible, so that we can ensure that suitable food options will be available for you. The workshop banquet will be held on Friday evening, September 9. We hope to be able to make the banquet free, but we may need to charge a small fee. You may invite family members and guests to attend the banquet. A future circular will provide updated information about the banquet. • We will provide breakfast, lunch, and two coffee breaks (free of charge to registered participants) during all three days of the workshop. In addition, the Thursday evening Welcome Reception will be free. We do not yet know how much we will need to charge for the Friday evening Banquet. Dinner will NOT be provided on Saturday, the last day of the workshop. • We will NOT provide bags to workshop attendees. All of you probably have closets full of bags received at other conferences and workshops over the years. Please bring your own bag to the conference. This is one way we can save money and avoid charging a registration fee. We will provide pens, notebooks, and abstract books to registered participants. • The breakfast items we will provide are Ham and Cheese Croissants, Scones with Butter and Jam, Fresh Fruit, Greek Yogurt, Orange Juice, Coffee, and Tea. We provide this information so that you can decide if you wish to eat breakfast at the workshop or find your own breakfast outside. • If you are on the program but are unable to attend the workshop, please let us know immediately so that we can offer your speaking slot to a deserving scholar on the waiting list. The Fourth Workshop on Sino-Tibetan Languages of Southwest China (STLS-2016) will be held at the University of Washington in Seattle, USA, September 8–10 (Thursday–Saturday), 2016. This is the eighth circular announcing the preliminary program and serving as a reminder about upcoming deadlines. A preliminary program is now available on the workshop website. This program is not finalized—there will certainly be at least some changes. If you are a presenter, please take a look to ensure that your presentation is scheduled, and that your name and talk title are correct. Please contact the organizers immediately if the scheduled time of your talk needs to be changed. If you are on the program but are unable to attend the workshop, please let us know immediately so that we can offer your speaking slot to a deserving scholar on the waiting list. We plan to make the Welcome Reception (Thursday, September 8) and the Banquet (Friday, September 9) open to guests as well as workshop attendees. Information on signing up for the Reception and Banquet will be forthcoming in a future circular. If you need a hotel room, visit the lodging page of the website for instructions on making a reservation. August 7 is the final guaranteed date to make reservations. Some rooms may be released to the general public before that date, so please make your reservation as soon as you can. You might be able to make a reservation after August 7, but we can’t guarantee availability or discounted pricing. Important: If you have already registered for the workshop and indicated a hotel preference on the registration form, you do not have a hotel reservation! You must follow the instructions to reserve a hotel room. If you are a student and would like to stay with a University of Washington graduate student free of charge during the workshop, please contact the organizers. A very small number of spaces are available thanks to the generosity of our students. Information pages on Travel and Seattle have been added to the website. The Travel page provides information on flying into Seattle and getting to the hotels and workshop site from the airport. The Seattle page provides information on local attractions and activities. We plan to provide breakfast, lunch, and two coffee breaks with snacks free of charge during all three days of the workshop. In addition, the Thursday evening Welcome Reception will be free. We do not yet know how much we will need to charge for the Banquet. Dinner will not be provided on Saturday, the last day of the workshop. Copies of all email cir­cu­lars are posted on the conference web site. If you did not receive this circular directly from stls2016@uw.edu, and would like to be added to the mailing list for future workshop announcements, please send a request by email to stls2016@uw.edu with your name and preferred email address.